Antimicrobial and immunomodulatory activity of pomegranate in the systemic candidiasis on Galleria mellonella. The increasing resistance of microorganisms to conventional antifungal drugs has encouraged studies designed to discover alternative therapies for infections caused by Candida spp. Pomegranate (Punica granatum L.) is an effective herbal extract with broad spectrum of antimicrobial action and able to modulate the immune response. In this study, we evaluated the antimicrobial and immunomodulatory pomegranate activity on in vivo candidiasis using Galleria mellonella model by survival percentage and hemocyte counts present in hemolymph, respectively. After selection of the non-toxic concentrations of both pomegranate and amphotericin B to G. mellonella larvae, two experimental designs were performed: prophylaxis by inoculating a single dose of extract, 24 hours before C. albicans infection, and therapy by inoculating single dose 1 hour after fungal infection. As control, larvae were infected/untreated, treated with amphotericin B or non-infected/untreated. Both treatments were effective against C. albicans infection by means of larvae survival curves. However, prophylactic effect of pomegranate resulted in longer survival time than therapy. Next, multiple doses of the extract were administered in larvae prior to infection, resulting in highest survival percentage and higher hemocyte density when compared to the infected and non-treated larvae. Concluding, the findings suggest that pomegranate possess antimicrobial action against C. albicans and immunomodulated the response in G. mellonella, with systemic candidiasis, principally in the prophylaxis using multiple doses. Punica granatum, toxicology, candida albicans, microbial resistance, alternative treatment. The fungus Candida albicans (C. albicans) is a commensal organism of the mucosal microbiota in the oral cavity, gastrointestinal and genitourinary tracts, presenting ability to switch reversibly between yeast, pseudohyphal, and hyphal growth forms. This polymorphism is one of the most investigated virulence attributes in mucosal infections and disseminated infections affecting susceptible individuals . The hyphal form plays key roles in the infection process, and can promote tissue penetration and escape from immune cells, causing vaginitis, oral candidiasis, cutaneous candidiasis, candidemia, and systemic infections . Systemic candidiasis is the most frequent hospital infection accounting for up to 15% of bloodstream infections, and Candida species are the main causative agents in 50-70% of systemic fungal infections [3-5]. The candidiasis treatment consists in the administration of antifungical agents such as nystatin, amphotericin B, clotrimazole, fluconazole, ketoconazole and itraconazole. However, the use of these drugs can cause side effects and lead to microbial development of resistance, being related in the presence of a small number of tolerant fungal cells, since the drugs decrease of the ergosterol synthesis in the cell membrane . The increase in the microorganism resistance to conventional antifungal drugs has encouraged studies designed to discover new treatments for infections caused by Candida spp. Therefore, alternative therapies for the candidiasis treatment are crucial and the use of herbal medicines seems being a promising solution [7,8]. Usually, the plants present numerous bioactive compounds that may be potent antimicrobial agents against C. albicans [9,10]. Thus, natural products can be a treatment viable alternative to replace or associate with conventional synthetic chemicals. In this context, the antimicrobial activity of pomegranate (Punica granatum Linné) against microorganisms has been widely investigated [11-14]. This extract is rich in two types of polyphenolic compounds: anthocyanins, which give the red color to fruits and juice, and hydrolyzable tannins, commonly related to the antimicrobial activity of this plant . Evaluating the antifungal activity of the extract and compounds isolated from peels of P. granatum against C. albicans, the antifungal activity has been associated predominantly to the presence of punicalagin, considered the main component of this plant . In addition, the pomegranate peels extract causes serious damage to the C. albicans yeasts cellular structure, interfering on fungal growth/development, and consequently preventing tissue invasion . However, the mechanism of action of the bioactive principles of this plant on the microorganisms is not clearly elucidated . In addition to this anti-Candida action, P. granatum also has immunomodulatory properties. The flavonoids extracted from the fermented juice and the oil from the seeds of this herbal medicine caused inhibition of the activity of cyclooxygenases and lipoxygenases [19,20]. Considering the C. albicans clinical importance, in vivo experimental models may be used as an important tool to study the Candida-host interaction, evaluating the pathogenicity, its development, diagnosing and controlling the disease, as well as testing new alternatives therapies for treatment [21,22], including the use of herbal medicines. Galleria mellonella (G. mellonella) has emerged as a modern alternative to study microbial infection based in vivo model systems. Among the several characteristics, G. mellonella larvae have the advantage of being able to grow at a broad range of temperatures, mimicking the natural environment of mammalian hosts, consequently allowing the C. albicans growth. In addition, G. mellonella model has been used to study the new drugs development as well as the immune response of the host. Therefore, G. mellonella is an in vivo experimental model advantageous for searching the C. albicans pathogenicity and new anti-fungal therapies [23-25]. Moreover, the immune response these insects bear many similarities to those obtained using mammals [26,27]. The G. mellonella larvae possess six different types of hemocytes in the hemolymph which are arranged in: pro-hemocytes, coagulocytes, spherulocytes, enocitoids, plasma cells and granulocytes which play a key role in cellular defense and are involved in phagocytosis, nodule formation and encapsulation. The plasma cells were also divided according to morphology and function in four other subclasses [28-31]. The result of the humoral immune response is the production of a range of antimicrobial peptides that immobilize and kill the pathogen . Thus, in the present study, we evaluated the antimicrobial activity of pomegranate in an experimental model of systemic candidiasis employing G. mellonella by the survival percentage and median time. Moreover, in order to evaluate the immunomodulatory activity of this herbal, hemocytes present in larvae hemolymph were counted. The pomegranate fruit peels were purchased in November from 2014 at the Supermarket from the Fruit Distributor and Seedlings Boa Fruta (Petrolina, PE, Brazil). The cultivation was done in Petrolina (9º46'30”S and 24º21'30”W) and an aliquot of fresh fruit peels (920 g) was submitted to complete drying with air circulation at 45°C. The hydroalcoholic pomegranate crude extract (70% EtOH) was obtained by percolation with the dried material (400 g) at room temperature. After removal of solvent, the extract was lyophilized, yielding 52 g (13%) . As control, it has used the conventional synthetic antifungal, Amphotericin B deoxycholate (C47H73NO17) which was purchased by Sigma® (Sigma Aldrich® Inc., St. Louis, USA). Chromatographic screening by high performance liquid chromatography coupled to photodiode array detector (HPLCPAD) was performed to characterize the main compounds present in the 70% EtOH. An aliquot of 10 mg of the crude extract was solubilized in 1 mL of MeOH:H2O (1:1, v/v), and filtered with PTFE membrane filter (0.45 μm). The analysis was performed using a Phenomenex® (Torrance, California, USA) Luna C18 (250 × 4.6 mm i.d., 5 μm) column and the mobile phase were MeOH+Ac. Formic (0.1%) (A) and H2O+Ac. Formic (0.1%) (B). The column was maintained at 40°C and the gradient used was 5-100% of B in A over 60 min. The analytical chromatograms were obtained at 254 nm. The Candida albicans fungal (ATCC 18804) was kept in a freezer -80°C in the Laboratory of Oral Microbiology and Immunology of the Institute of Science and Technology – UNESP, and cultured in broth Yeast Nitrogen Base (YNB, Sigma Aldrich® Inc., St. Louis, USA) supplemented with glucose at the concentration of 100 mM for 24 hours at 37°C. Cell suspension was adjusted to a final concentration of 108 viable cells/mL. The cells number was confirmed by determination of colony forming units per milliliter (CFU/mL) on plates contain Yeast Extract Peptone Dextrose Agar (YEDP, Sigma Aldrich® Inc., St. Louis, USA) . In the last larval stage (and/or already pupae), G. mellonella was placed in plastic containers with holes in the covers and a filter paper was placed to support egg-laying. The eggs containers were incubated at room temperature. After 20 days, the larvae were separated according to weight and transferred to containers with holes in the covers and food (meal of cornmeal, brewer's yeast, soybean meal, skimmed milk powder, honey, wax and glycerol) . The larvae were maintained at 28°C and stored darkness in Laboratory of Oral Microbiology and Immunology of the Institute of Science and Technology, UNESP, at final larval stage, with a body weight of approximately 250-300 mg. All the larvae used in the experiment had clear color and they were free of spots and/or dark pigments on their cuticle, which could indicate impairment of the animal due to some infectious process and influence the experiment results (Figure S1). Initially, pomegranate and Amphotericin B toxicity in G. mellonella was evaluated before assessment of its antimicrobial action. Finally, the prophylactic and therapeutic potential of the pomegranate extract against C. albicans infection was evaluated. In all steps, G. mellonella survival test was performed. Different concentrations of Pg (1, 0.5, 0.25, 0.10 and 0.05 mg/ mL), diluted in phosphate buffered saline (PBS) and dimethyl dulfoxide (DMSO 5%), or different concentrations of AmpB (31.25, 15.65, 7.8 and 3.9 μg/mL), diluted in sterile distilled water, were inoculated into the last right proleg of each larva (n=15/concentration). For control, larvae were inoculated with PBS into the right proleg (n=15). An aliquot of 10 μL of each concentration was inoculated with a Hamilton® syringes (Hamilton Inc., USA). Next, the larvae were kept in a Petri dish at 37°C in the darkness, without nutrition (Figure S2). From 24 hours after the inoculations, the number of dead G. mellonella was daily recorded up to 168 hours (i.e., 7 days) for analysis of the survival curve. The larvae were considered dead when they did not show any movement after being touched. After obtaining non-toxic concentrations in G. mellonella, they were used for assessment of the antimicrobial action of pomegranate against C. albicans. Analysis of antimicrobial activity was based on the methodology described by Mylonakis et al. and Fuchs et al. . After determination the non-toxic concentrations of Pg and AmpB, larvae were randomly divided into two groups: prophylactic and therapeutic. In the prophylactic group (n=15), larvae were first injected with single dose of Pg (0.10 mg/mL) into the last right proleg; after 24 hours, the larvae were infected with 10 μL of C. albicans (Group Pg+Ca) into the last left proleg. In the therapeutic group (n=15), the larvae were infected with 10 μL of C. albicans in the last proleg right and, after 1 hour, they were treated with 10 μL of Pg (0.10 mg/mL) in the last left proleg (Group Ca+Pg). As gold standard, larvae were infected with C. albicans and treated with AmpB (3.9 μg/mL) 1 hour post infection (Group Ca + AmpB). As control groups, larvae were pre-treated with PBS and infected with C. albicans after 24 hours (Group PBS + Ca) - prophylactic control (n=15); larvae were infected with C. albicans and, 1 hour later, treated with PBS (Group Ca+PBS) - therapeutic control (n=15); and larvae were inoculated with PBS in right and left proleg (Group PBS+PBS) - negative control (n=15). For all treatments, after the last injection, the larvae were kept in a Petri dish at 37°C in the darkness. The number of dead larvae was observed and recorded 18, 24, 48, 72, 96, 120, 144 and 168 hour pos-infection (i.e., 7 days), for analysis of the survival curve . By consider that the prophylaxis with single dose resulted in a longer survival time of the larvae (until 120 hours) in relation to the therapy (survival until 72 hours), the pomegranate prophylactic potential was evaluated by the administration of multiple doses prior C. albicans infection (see Results/ Observations section). Therefore, larvae received 1, 2 or 3 doses (i.e., 24 hours; 48 and 72 hours; or 72, 48 and 24 hours before C. albicans infection) of 10 μL of Pg (0.10 mg/mL) into the last right proleg. Afterwards, the larvae were infected with C. albicans (10 μL) into the last left proleg. These groups (n=15 per group) were named as following: Pg+Ca (24 h), Pg+Ca (48/24 h) and Pg+Ca (72/48/24 h). As controls (n=15 per group), larvae were inoculated with PBS into the right and left prolegs (Group PBS+PBS) as well as larvae were previously treated with PBS and infected with C. albicans after 24 h (Group PBS+Ca). After the last inoculation, the larvae were kept in a Petri dish at 37°C in the darkness. The larvae were submitted to analysis of the survival curve and to the determination of hemocyte density. After the last inoculation of C. albicans or PBS, the larvae were kept at 37°C for 3 hours and sequenced in ice-cold Petri dishes (-20°C) for 2 minutes. The larvae were then cut in the cephalocaudal direction with a scalpel blade and squeezed to remove the hemolymph, which was transferred to a microtube and diluted in cold sterile insect physiologic saline (IPS - 150 Mm sodium; 5 mM potassium chloride; 100 Mm Trishydrochloride, pH 6.9 with 10 mM EDTA, and 30 mM sodium citrate). Next, the cellular suspension (106 cells/mL) was submitted to Tripan Blue solution for counting the hemocytes using a hemocytometer . The results were presented by mean ± SD. For the quantification of G. mellonella hemocyte, 15 larvae per group were used, totalizing 75 larvae. For antimicrobial activity analysis, survival curves of G. mellonella were plotted and statistical analysis was performed by using the log-rank test (Mantel-Cox). For determination of hemocyte density was used means ± SD for the ANOVA One-Way, followed by post-hoc Tukey HSD. Both analyzes were made in the GraphPad Prism® statistical software and the significance level was set up at p<0.05. The analytical chromatogram analysis (HPLC-PAD) of the crude extract (70% EtOH) revealed 16 compounds by combining the interpretation of retention time (Rt) and UV spectra region (λmax). Peaks, detected from HPLC-PAD chromatography, with absorption in the spectral range of 254 nm to 380 nm, 260 nm to 380 nm and 254 nm to 362 nm in this plant matrix indicate the possible presence of punicalin, ellagic acid and ellagitannin derivatives (Table 1 and Figure 1) [37,38]. Table 1: Compounds identified from pomegranate peels extract (70% EtOH) by high performance liquid chromatography coupled to photodiode array detector (HPLC-PAD) [u.c=corresponds to unidentified compounds, Rt (min)=corresponds to retention time of the compound from its injection to the detection system output in minutes, UV (λmax)=corresponds to detection of the ultraviolet (UV) spectrum region at the wavelength (nm) maximum]. Figure 1. Analytical chromatogram of ultraviolet spectra peaks (UV) of pomegranate peels extract (70% EtOH) obtained by high performance liquid chromatography coupled to photodiode array detector (HPLC-PAD). Solvents MeOH+Formic Acid. (0.1%) (A) and H2O+Formic Acid. (0.1%) (B). Gradient: 5-100% B in A in 60 min. Phenomenex® Luna C18 column (250 × 4.6 mm i.d., 5 μm) HPLC (Jasco®). Column Oven: 40°C. Flow: 1 mL min-1. Injection vol. : 15 μL. λ=254 nm. Peaks are numbered according to the compounds listed in Table 1. No differences were observed in the pomegranate or Amphotericin B toxic evaluation, independently of the concentration (p=0.2784 for Pg and p=0.1155 for AmpB). Pomegranate at concentrations of 0.10 and 0.05 mg/mL (Figure 2a) and Amphotericin B at concentration of 3.9 μg/mL (Figure 2b), showed no toxicity to the larvae, showing survival of 100%, similar to the control group (PBS). Therefore, the highest non-toxic concentrations (0.10 mg/mL for Pg and 3.9 μg/mL for AmpB) were used in the next protocols. Figure 2: Toxicity test in G. mellonella. Survival curves of larvae were plotted and statistical analysis was performed by using the log-rank test (Mantel-Cox). After infections (0 h), the number of dead G. mellonella was daily recorded (24, 48, 72, 96, 120, 144 and 168 h) h for analysis of the survival curve (n=15 per concentration). For control, larvae were inoculated with PBS into the right proleg (PBS) (n=15). Different concentrations of pomegranate - Pg (1, 0.5, 0.25, 0.10 and 0.05 mg/mL), diluted in PBS and DMSO (5%), were inoculated in the last right proleg of each larva (a). Different concentrations of Amphotericin B – AmpB (31.25, 15.65, 7.8 and 3.9 μg/mL), diluted in sterile distilled water, were inoculated in the last right proleg of each larva (b). The values of survival percentage reached to 6.6%, after prophylaxis with single dose (Pg+Ca) and therapy (Ca+Pg) by means of pomegranate. However, the prophylaxis resulted in a longer survival time of the larvae, i.e., until 120 h, compared to the 72 hours; survival median time obtained after therapeutic treatment. The survival median time was at 48 hours for both types of treatment. Also, both presented significant difference (p<0.0001) in relation to the respective controls (infected with C. albicans without any treatment), which presented higher values of larval death (93% after 24 h in the PBS+Ca; and 60% after 18 h in the Ca+PBS), reaching survival median time in 18 hours for both groups (Figure 3a). Figure 3: Antimicrobial activity of pomegranate (Pg) in G. mellonella. After injections (0 h), the number of dead G. mellonella was daily recorded (24, 48, 72, 96, 120, 144 and 168 h) for analysis of the survival curve (n=15 per group). Survival curves of G. mellonella were plotted and statistical analysis was performed by using the log-rank test (Mantel-Cox). As controls, larvae were inoculated with PBS in right and left proleg (PBS+PBS), as well as larvae were infected with C. albicans and treated with AmpB 1 h post infection (Ca+AmpB). For prophylaxis with single dose, larvae were pre-treated with Pg (Pg+Ca) or PBS (PBS+Ca-control) and, after 24 h, they were infected with C. albicans. For therapy, larvae were infected with C. albicans and, after 1 h, they were treated with Pg (Ca+Pg) or (Ca+PBS–control) (a). Comparison of survival percentage of G. mellonella considering all groups or between PBS+PBS, Ca+AmpB, Pg+Ca, and Ca+Pg groups (b). The infection treatment by C. albicans using the non-lethal AmpB concentration (3.9 μg/mL) resulted in the survival of 13.3% of the larvae until the seventh day of infection (168 h), and the survival median time also was in 48 hours. In the PBS+PBS group, there was no death of G. mellonella. The prophylaxis (Pg+Ca), therapy (Ca+Pg) and control with AmpB (Ca+AmpB) did not present significant difference between them (p=0.7807) (Figure 3b). Considering the results above-mentioned, it was evaluated prophylactic potential of pomegranate after administration of multiple doses (0.10 mg/mL) prior to C. albicans infection [Pg+Ca (24/48/72 h)], in G. mellonella. This prophylaxis based on three doses resulted in a higher percentage of survival (93.3%) until the last experimental day (i.e., 168 hours), than the other treated groups. This percentage differed significantly p<0.0001) from the survival percentage of infected and untreated larvae (PBS+Ca), and it was similar to that observed in the control group (PBS+PBS), which no death of G. mellonella was observed [39-42]. The survival percentage of larvae reached 46.6% until the 168 hours, with survival median time in 96 hours, after prophylaxis with two doses [Pg+Ca (48/24 hours)]. After a prophylaxis with single dose [Pg+Ca (24 hours)], 6.6% of the larvae survived after 72 hours, and the survival median time was at 48 hours. The non-treated group (PBS+Ca) showed 93% of the dead larvae after 24 hours post-infection, with survival median time also at 18 hours (Figure 4). 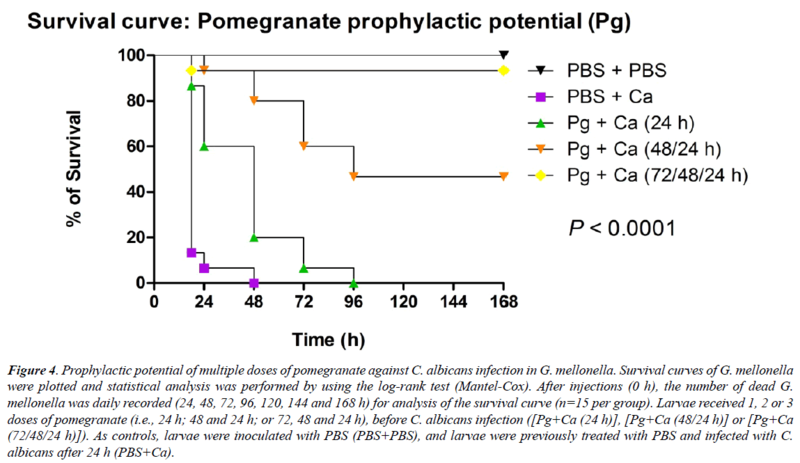 Figure 4: Prophylactic potential of multiple doses of pomegranate against C. albicans infection in G. mellonella. Survival curves of G. mellonella were plotted and statistical analysis was performed by using the log-rank test (Mantel-Cox). After injections (0 h), the number of dead G. mellonella was daily recorded (24, 48, 72, 96, 120, 144 and 168 h) for analysis of the survival curve (n=15 per group). Larvae received 1, 2 or 3 doses of pomegranate (i.e., 24 h; 48 and 24 h; or 72, 48 and 24 h), before C. albicans infection ([Pg+Ca (24 h)], [Pg+Ca (48/24 h)] or [Pg+Ca (72/48/24 h)]). As controls, larvae were inoculated with PBS (PBS+PBS), and larvae were previously treated with PBS and infected with C. albicans after 24 h (PBS+Ca). Finally, after the efficacy demonstrated in relation prophylactic administration of pomegranate, it was measured the hemocytes number of C. albicans-infected larvae previously treated or not with multiple doses of extract. The hemocyte density assay allows a quantitatively evaluation of immune response of larvae elicited after this treatment . As expected, the control group (PBS+PBS) presented the highest values of hemocyte quantification, regardless of the number of doses of PBS administered. The infected, but non-treated, group (PBS+Ca), in turn, showed the lowest values (p<0.001) in relation to matched control. Only the prophylaxis with single dose of P. granatum extract [Pg+Ca (24 hours)] resulted in significantly higher values of hemocyte density, compared to the infected group (PBS+Ca). Although, there was no statistical difference between the prophylaxis with multiple doses and the infected group, the values of hemocyte density were higher when the larvae were treated, especially 72 hours before (Figure 5). Figure 5: Determination of hemocyte density in G. mellonella larvae, after prophylaxis with single dose [Pg+Ca (24 h)] or multiple doses [Pg+Ca (48/24 h) or Pg+Ca (72/48/24 h)] of pomegranate. As controls, larvae were only inoculated with PBS (PBS+PBS), and larvae were previously treated with PBS and infected with C. albicans after 24 h (PBS+Ca). Statistical comparisons were separately performed for each time/ doses. (#) p<0.001 vs PBS+Ca or Pg+Ca; (*) p<0.001 vs Pg+Ca. ANOVA One-Way, followed by post-hoc Tukey HSD. It is known that Candida species are the most common fungal causes of deep-seated and disseminated infections in immunocompromised human hosts, and are associated with high morbidity and mortality in this population [43,44]. Therefore, there are an increasing number of researchers seeking new alternatives therapies due to the high number of infections whose agents are resistant to conventional treatments as well as the emergence of new pathogenic strains. One of the safe and economical alternatives studied is the use of medicinal plants which have shown some antimicrobial activity . According to Veiga Jr. et al. , the World Health Organization (WHO) defines medicinal plant as any plant possessing substances which may be used for treatment purposes or used in the production of semisynthetic drugs. Pomegranate (Punica granatum Linné) fruit (seeds, peel, and juice) seem to have medicinal benefits, such as strong antimicrobial, anti-inflammatory, antioxidant, antiobesity, and antitumoral properties . The study of its bioactive components has aimed at the development of herbal products with therapeutic applications . Many beneficial properties are related to the presence of ellagic acid, ellagitannins (including punicalagins), punicic acid and other fatty acids, flavonoids, anthocyanidins, anthocyanins, estrogenic flavonols, and flavones, which seem to be the main therapeutically beneficial components of pomegranate. However, the synergistic action of the crude extract constituents appears to be superior when compared to individual constituents of pomegranate [47,48]. In the present study, the prophylaxis with single dose as well as the therapy resulted in higher time survival of G. mellonella than non-treated larvae, which died 24 hours post-infection by C. albicans. From these results it was possible to suggest the anti-Candida activity of pomegranate, both prophylactic and therapeutic. Moreover, the survival percentage post-treatment with the herbal extract was similar to that obtained after treatment with Amphotericin B. Therefore, in this experimental model in vivo, pomegranate was as effective as a broad-spectrum antifungal widely used for the treatment of Candida infections. In fact, when we performed the chromatographic screening of extract, the main compounds identified were ellagic acid derivatives and ellagitannins, such as punicalin. Recently, it has been found that punicalagin, pedunculagin, telimagrandin and galagildilacton have important antimicrobial action against C. albicans yeast cellular structure [11,17]. Thus, the main compound involved in anti-Candida action present of the P. granatum fruit peels seems to be the punicalagin [16,17,38]. Although the survival percentage of G. mellonella after prophylaxis was similar to that obtained after the therapy using the extract, our results showed that prophylaxis, with single dose, increased the time of survival the larvae in relation to the therapy. Interestingly and innovative way, the prophylactic administration of 3 doses resulted in a higher survival percentage of the larvae when compared to single dose prophylaxis. The survival percentage was proportional to number of doses previously injected, that is, the more doses of pomegranate administered, the more larvae survived after infection. In fact, our results indicate that the sequential administration of multiple doses prior to C. albicans infection amplified benefic potential of this extract. Once the efficacy of pomegranate prophylactic administration was demonstrated, changes in the hemocyte density during infection or treatment were used as a parameter of the response of the larvae . It is noteworthy that the G. mellonela model used here is useful for as certaining immunopathological aspects because the larvae are able to activate cellular and humoral immune responses against microorganisms by means of their circulating hemocytes [50,51]. Then, this experimental model becomes an increasingly popular choice for the investigation of the fungal pathogenesis, as in C. albicans infection. In this context, G. mellonella has been successfully employed in studies on alternative antifungal therapies [24,27,52]. In this work, it was observed a significant reduction in the number of hemocytes in larvae 24 post-infection with C. albicans compared with larvae non-stimulated that showed the higher values of hemocyte density. Corroborating our findings, Dos Santos et al. 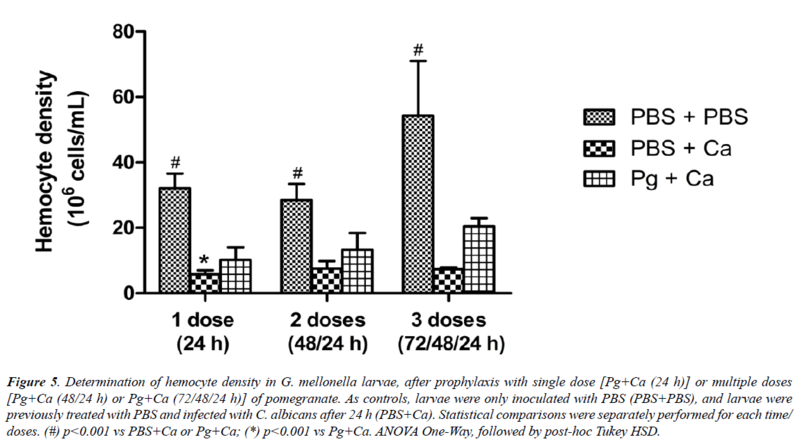 observed that Porphyromonas gingivalis suppressed hemocyte density in G. mellonella. Possibly, the larvae death is related to the extensive fungal proliferation and alteration of C. albicans morphology from yeast to hyphae or pseudo-hyphae during the infection installation process. The pseudo-hyphaes, in turn, can lead to death of the hemocytes through mechanisms of evasion of the immune system, and can reduce the efficacy of the phagocytic capacity of these cells against C. albicans [53,54]. Moreover, it has been shown that larvae infected by Actinobacillus pleuropneumoniae, Aspergillus fumigatus and Bacillus thuringiensis present a reduction of the hemocystic population in general, increase in the number of granular hemocytes, and proteomic alterations indicative of cellular stress, tissue damage and sequestration of major proteins related to the formation of immune complexes [23,55-57]. The results of present study indicate that these deleterious effects to immune system of larvae caused by infection by C. albicans were attenuated by the prophylactic administration of pomegranate, which avoided the striking decrease of hemocyte density elicited by fungus. These data may suggest that the antimicrobial capacity of the extract, as observed here, resulted in the reduction of the fungal load in the hemolymph. Additionally, pomegranate must have contributed to the strengthening of larvae immune response that involves non-specific immune reactions (production of antimicrobial peptides, melanization) or specifics (regulation the production of antimicrobial peptides and activation of phagocytic cells) . In this sense, pomegranate had an immunomodulatory effect, consequently protecting larvae against C. albicans, as previously showed by De Oliveira et al. , Dos Santos et al. and Rossoni et al. . In the present work, the protective effect of extract related to number of hemocytes is in accordance with those data from survival curve. Then, pomegranate seems to present a protective role against C. albicans infection in G. mellonella larvae. Regarding the experimental model used in the present study, insects are considered as convenient models for studying microbial infections and host resistance against microorganisms, although pathogens are capable of acting on the host epigenetic machinery and influence the evolution of resistance/tolerance to infection by the host. An increasing number of works from different fields have turned to study of insects, fish and worms by the advantages offered by these models as ethical acceptability, for being relatively simple and inexpensive and for modeling a variety of human infectious diseases. Because of this, the insects may be used to discovery of new treatment strategies, such as using of herbal medicines. In addition, these insect models give results comparable to those obtained using mammals, since the insects have an immune system analogous to the innate response of mammals [23,41,59,60]. However, insect species differ in their susceptibility to fungal infections, which possibly results in the adaptation, by the natural selection process, of their immune defenses to local conditions. These differences may be linked to a wide range of factors including the presence of symbiotic organisms, melanism and genetic variation. For example, the darkened cuticle of melanic insects, such as G. mellonella, has been related to protection against pathogenic fungi [42,61-64]. Therefore, further studies should be performed in order to authenticate and identify the mechanisms involved in benefic action of pomegranate. Taking into account the incidence of invasive fungal infections caused by Candida spp., to date C. albicans remains the most frequently isolated Candida species in the clinical setting and is the principal agent of nosocomial yeast infections [1,2]. Thus, the resistance of these pathogens to conventional synthetic treatments and the side effects strongly related to frequent use strengthens the search for new therapeutic alternatives with antimicrobial potential, such as the use of medicinal plants. In future, plants with antimicrobial potential, which have not yet been reported for microbial resistance and important adverse effects, such as pomegranate, may be potential agents for a synergistic action with conventional antifungal for the treatment of candidiasis. The G. mellonella species with systemic candidiasis treated prophylactically or therapeutically with pomegranate survived for longer than infected and untreated larvae. However, when administration occurred through multiple prophylactic doses, more larvae survived the infection and for a longer time; in addition, these larvae showed a higher density of hemocytes in their hemolymph compared to untreated larvae. These data suggest that pomegranate presents antifungal and immunomodulatory activity against systemic candidiasis in G. mellonella model, principally after prophylaxis with multiple doses. The authors thank Giane Carminato for their English Language Review Services. This study was supported by the Coordination for the Improvement of Higher Education Personnel (CAPES), National Council for Scientific and Technological Development (CNPq) and State of São Paulo Research Foundation (FAPESP) under grant [no. 2015/03965-2]. Calderone RA, Fonzi WA. Virulence factors of Candida albicans. Trends Microbiol 2001;9:327-35. Wächtler B, Citiulo F, Jablonowski N, et al. Candida albicans-epithelial interactions: dissecting the roles of active penetration, induced endocytosis and host factors on the infection process.PLoS One 2012; 7:e36952. Cornely OA, Bassetti M, Calandra T, et al. ESCMID guideline for the diagnosis and management of Candida diseases 2012: non-neutropenic adult patients.Clin Microbiol Infect 2012; 8:19-37. Lionakis MS, Netea MG. Candida and host determinants of susceptibility to invasive candidiasis. PLoS Pathog 2013; 9:e1003079. Barchiesi F, Orsetti E, Osimani P, et al. Factors related to outcome of bloodstream infections due to Candida parapsilosis complex.BMC Infect Dis 2016; 16:387. Swinne D, Watelle M, Nolard N. In vitro activities of voriconazole, fluconazole, itraconazole and amphotericin B against non-Candida albicans yeast isolates. Rev Iberoamericana Micol 2005; 22:24-8. Budzyńska A, Wieckowska-Szakiel M, Sadowska B, et al. Antibiofilm activity of selected plant essential oils and their major components. Pol J Microbiol 2011; 60:35-41. Harris R. Progress with superficial mycoses using essential oils. Int J Aromather 2002; 12:83-91. Koo H, Gomes BP, Rosalen PL, et al. In vitro antimicrobial activity of propolis and Arnica montana against oral pathogens. Arch Oral Biol 2000; 45:141-8. Samet N, Laurent C, Susarla SM, et al. The effect of bee propolis on recurrent aphthous stomatitis: a pilot study. Clin Oral Investig 2007; 11:143-7. Bakkiyaraj D, Nandhini JR, Malathy B, et al. The anti-biofilm potential of pomegranate (Punica granatum L.) extract against human bacterial and fungal pathogens. Biofouling 2013; 29:929-37. Labsi M, Khelifi L, Mezioug D, et al. Antihydatic and immunomodulatory effects of Punica granatum peel aqueous extract in a murine model of echinococcosis. Asian Pac J Trop Med 2016; 9:211-20. Naqvi SAH, Khan MSY, Vohora SB. Antibacterial, antifungal and antihelmintic investigations on Indian medical plants. Rev Fitoterapia 1991; 62:221-28. Almeida NLM, Saldanha LL, da Silva RA, et al. Antimicrobial activity of denture adhesive associated with Equisetum giganteum- and Punica granatum-enriched fractions against Candida albicans biofilms on acrylic resin surfaces. Biofouling 2018; 34:62-73. Jurenka JS. Therapeutic applications of pomegranate (Punica granatum L.): a review. Altern Med Rev 2008; 13:128-44. Endo EH, Cortez DA, Ueda-Nakamura T, et al. Potent antifungal activity of extracts and pure compound isolated from pomegranate peels and synergism with fluconazole against Candida albicans. Res Microbiol 2010; 161:534-4. Anibal PC, Peixoto IT, Foglio MA, et al. Antifungal activity of the ethanolic extracts of Punica granatum L. and evaluation of the morphological and structural modifications of its compounds upon the cells of Candida spp. Braz J Microbiol 2013; 44:839-48. Vasconcelos LC, Sampaio FC, Sampaio MC, et al. Minimum inhibitory concentration of adherence of Punica granatum Linn (pomegranate) gel against S. mutans, S. mitis and C. albicans. Braz Dent J 2006; 17:223-7. Gracious Ross R, Selvasubramanian S, Jayasundar S. Immunomodulatory activity of Punica granatumin rabbits--a preliminary study. J Ethnopharmacol 2001; 78:85-7. Schubert SY, Lansky EP, Neeman I. Antioxidant and eicosanoid enzyme inhibition properties of pomegranate seed oil and fermented juice flavonoids. J Ethnopharmacol 1999; 66:11-7. Miranda TT, Vianna CR, Rodrigues L, et al. Diversity and frequency of yeasts from the dorsum of the tongue and necrotic root canals associated with primary apical periodontitis. Int Endod J 2009; 42:839-44. Takakura N, Sato Y, Ishibashi H, et al. A novel murine model of oral candidiasis with local symptoms characteristic of oral thrush. Microbiol Immunol 2003; 47:321-6. Fallon JP, Reeves EP, Kavanagh K. The Aspergillus fumigatus toxin fumagillin suppresses the immune response of Galleria mellonella larvae by inhibiting the action of hemocytes. Microbiology 2011; 157:1481-8. Fuchs BB, Eby J, Nobile CJ, et al. Role of filamentation in Galleria mellonella killing by Candida albicans. Microbes Infect 2010; 12:488-96. Kelly J, Kavanagh K. Caspofungin primes the immune response of the larvae of Galleria mellonella and induces a nonspecific antimicrobial response. J Med Microb 2011; 60:189-96. Desbois AP, Coote PJ. Utility of greater wax moth larva (Galleria mellonella) for evaluating the toxicity and efficacy of new antimicrobial agents. Adv Appl Microbiol 2012; 78:25-53. Mylonakis E, Morena R, El Khoury JB, et al. Galleria mellonella as a model system to study Cryptococcus neoformans pathogenesis. Infect Immun 2005; 73:3842-50. Fuchs BB, O'Brien E, Khoury JB, et al. Methods for using Galleria mellonella as a model host to study fungal pathogenesis. Virulence 2010; 1:475-82. Lionakis MS. Drosophila and Galleria insect model hosts: new tools for the study of fungal virulence, pharmacology and immunology. Virulence 2011; 2:521-7. Ligeza-Zuber M. Mechanisms of Galleria mellonella cellular immune response after infection with entomopathogenic fungus Conidiobolus coronatus Ann Parasitol 2012; 58:227-8. Arvanitis M, Glavis-Bloom J, Mylonakis E. Invertebrate models of fungal infection. Biochim Biophys Acta 2013; 1832:1378-83. Kavanagh K, Reeves EP. Exploiting the potential of insects for in vivo pathogenicity testing of microbial pathogens. FEMS Microbiol Rev 2004; 28:101-12.
de Campos Rasteiro VM, da Costa AC, Araújo CF, et al. Essential oil of Melaleuca alternifolia for the treatment of oral candidiasis induced in an immunosuppressed mouse model. BMC Complement Altern Med 2014; 14:489. Jorjão AL, Oliveira, LD, Scorzoni L, et al. From moths to caterpillars: Ideal conditions for Galleria mellonella rearing for in vivo microbiological studies. Virulence 2018; 9: 383-9. Vilela SF, Barbosa JO, Rossoni RD, et al. Lactobacillus acidophilus ATCC 4356 inhibits biofilm formation by C. albicans and attenuates the experimental candidiasis in Galleria mellonella. Virulence 2015; 6:29-39. Dos Santos JD, de Alvarenga JA, Rossoni RD, et al. Immunomodulatory effect of photodynamic therapy in Galleria mellonella infected with Porphyromonas gingivalis. Microb Pathog 2017; 110:507-11. Sticher O. Natural product isolation. Natural Product Reports 2008; 25:517-54. García-Villalba R, Espín JC, Aaby K, et al. Validated Method for the Characterization and Quantification of Extractable and Nonextractable Ellagitannins after Acid Hydrolysis in Pomegranate Fruits, Juices, and Extracts. J Agric Food Chem 2015; 63:6555-66. Laland K, Uller T, Feldman M, et al. Does evolutionary theory need a rethink? Nature 2014; 514:161-4. Mukherjee K, Grizanova E, Chertkova E, et al. Experimental evolution of resistance against Bacillus thuringiensis in the insect model host Galleria mellonella results in epigenetic modifications. Virulence 2017; 8:1618-30. Junqueira JC. Galleria mellonella as a model host for human pathogens: Recent studies and new perspectives. Virulence 2012; 3:474-6. Dubovskiy IM, Whitten MM, Yaroslavtseva ON, et al. Can insects develop resistance to insect pathogenic fungi? PLoS One 2014; 8:e60248. Rossoni RD, Dos Santos Velloso M, Figueiredo LMA, et al. Clinical strains of Lactobacillus reduce the filamentation of Candida albicans and protect Galleria mellonella against experimental candidiasis. Folia Microbiol (Praha) 2018; 63:307-14. Mayer FL, Wilson D, Hube B. Candida albicans pathogenicity mechanisms. Virulence 2013; 4:119-28. Gomes LAP, Figueiredo LMA, Palma ALR, et al. Punica granatum L. (Pomegranate) Extract: In Vivo Study of Antimicrobial Activity against Porphyromonas gingivalis in Galleria mellonella Model. Sci World J 2016; pp:e8626987. Veiga VF, Pinto AC, Maciel MAM. Medicinal plants: safe cure? Quím Nova 2005; 28:519-28. Hontecillas MVR, Lu P, Bassaganya-Riera J. Preventive and Prophylactic Mechanisms of Action of Pomegranate Bioactive Constituents Evid Based Complement Alternat Med 2013; pp:e789764. Rahimi HR, Arastoo M, Ostad SN. A Comprehensive Review of Punica granatum (Pomegranate) Properties in Toxicological, Pharmacological, Cellular and Molecular Biology Researches. Iran J Pharm Res 2012; 11:385-400. Banville N, Browne N, Kavanagh K. Effect of nutrient deprivation on the susceptibility of Galleria mellonella larvae to infection. Virulence 2012; 3:497-503. Strand MR. The insect cellular immune response. Insect Sci 2008; 15:1-14. Hoffmann JA, Kafatos FC Jr., Janeway CA, et al. Phylogenetic perspectives in innate immunity. Science 1999; 284:1313-8. Marcos CM, de Oliveira HC, de Melo WCMA, et al. Anti-Immune Strategies of Pathogenic Fungi. Front Cell Infect Microbiol 2016; 6:142. Sheehan G, Kavanagh K. Analysis of the early cellular and humoral responses of Galleria mellonella larvae to infection by Candida albicans. Virulence 2018; 9:163-72. Arteaga Blanco LA, Crispim JS, Fernandes KM, et al. Differential cellular immune response of Galleria mellonella to Actinobacillus pleuropneumoniae. Cell Tissue Res 2017; 370:153-68. Dubovskiy IM, Grizanova EV, Whitten MM, et al. Immuno-physiological adaptations confer wax moth Galleria mellonella resistance to Bacillus thuringiensis. Virulence 2016; 7:860-70.
de Oliveira FE, Rossoni RD, de Barros PP, et al. Immunomodulatory effects and anti-Candida activity of lactobacilli in macrophages and in invertebrate model of Galleria mellonella. Microb Pathog 2017; 110:603-11. Rossoni RD, Fuchs BB, Barros PP, et al. Lactobacillus paracasei modulates the immune system of Galleria mellonella and protects against Candida albicans infection. PLoS One 2017; 12:e0173332. Fallon J, Kelly J, Kavanagh K. Galleria mellonella as a model for fungal pathogenicity testing. Methods Mol Biol 2012; 845:469-85. Bierne H, Nielsen-LeRoux C. Is there a transgenerational inheritance of host resistance against pathogens? Lessons from the Galleria mellonella-Bacillus thuringiensis interaction model. Virulence 2017; 8:1471-4. Gruner DS, Kolekar A, McLaughlin JP, et al. Host resistance reverses the outcome of competition between microparasites. Ecology 2009; 90:1721-8. Maurer E, Hörtnagl C, Lackner M, et al. Galleria mellonella as a model system to study virulence potential of mucormycetes and evaluation of antifungal treatment. Med Mycol 2018. Kraaijeveld AR, Godfray HCJ. Selection for resistance to a fungal pathogen in Drosophila melanogaster. Heredity 2008; 100:400-6. Trienens M, Rohlfs M. Experimental evolution of defense against a competitive mold confers reduced sensitivity to fungal toxins but no increased resistance in Drosophila larvae. BMC Evolutionary Biology 2011; 11:206.